Paul Wood (Woody), Danny Robinson, Mike Fisher, Jeremy Lynch and Sami Hall are five British football fans who decide to busk their way from London to Argentina, using their football freestyling skills, in the hopes of meeting their idol, Diego Maradona. Things start well but cash-flow problems and personality clashes eventually force them to split into different groups. Will they get to meet their handballing, sorry, footballing hero? What makes this documentary so compelling is that each of the boys (aged between 17 and 22) has their own deeply personal reason for wanting to embark on their madcap quest. For example, Mike lost two of his best friends (also freestylers) in a car crash, while Sami has a bad boy past and a criminal record and is desperate to prove to his mother (who has all but given up on him) that he's changed for the better. 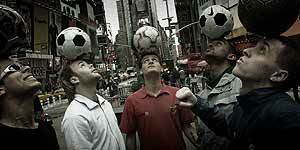 The boys are genuinely talented freestylers and there are several superb scenes. Highlights include a humbling meeting with a Guatemalan family, the boys' sudden realisation that every other Brazilian can do their freestyle tricks and an amusing encounter with two Hollywood wannabes (who, you suspect, only took the boys in because of the accompanying film crew). The camera crew follows the boys throughout their highs (you really feel their infectious joy when they make enough cash for the next stage of their trip) and their lows, notably when personality clashes start to emerge. It's also surprisingly moving in places and you may find yourself shedding a surreptitious tear. This is an enjoyable documentary with likeable characters and an engaging story. You'll laugh, you'll cry, you'll go out in the garden and try to bounce balls off your head. Worth seeing.